Apple Maps usage down to just 4 per cent? Only four per cent of iOS 6 users are making use of Apple's disastrous Maps app, according to new figures. Mobile data management company Snappli, which helps people stay within their limits by compressing data and video, pulled the numbers from its iOS 6-toting users in the United States and the UK. The company claims that 25 per cent of its users were using Google Maps on a daily basis before the switch to iOS 6. 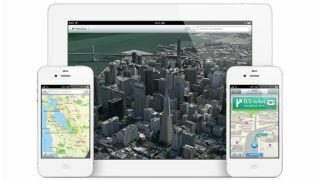 Shortly after installing the new update, 35 per cent of the 5,000 users with iOS 6 were giving Apple Maps a try each day. In the ensuing days, that number dropped to just four per cent, meaning only 1-in-25 iOS 6 users (that also use Snappli) are currently persevering with the service. That number, gleaned a couple of days ago, is still falling according to the company. On Friday Apple CEO Tim Cook issued a stunning apology for the malfunctioning Maps app, and openly suggested that iOS 6 users pin Nokia Maps or Google Maps to their homescreen while his troops fix the mess. If iPhone, iPad and iPod touch users heed his advice, the number of people still using Apple Maps may become negligible within the next few weeks. Of course, Snappli's data comes from only one source, so it's difficult to equate it with the entire iOS 6 community. However, it does offer an interesting look at the drop-off in users Maps has experienced in the last couple of weeks.